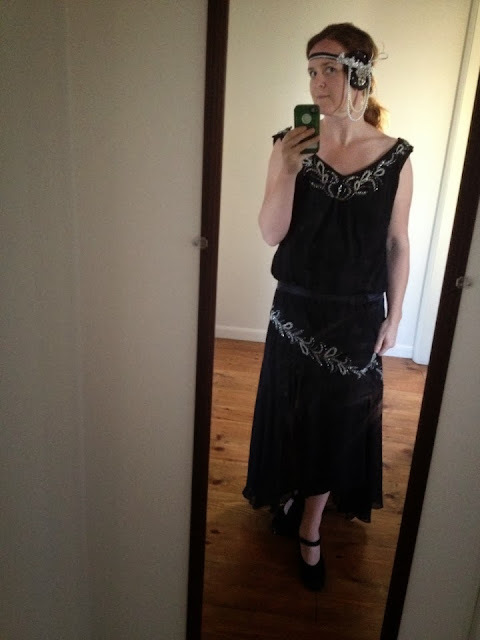 My husband's work Christmas party is a murder mystery set in the 1920's. I made my headpiece for the party that is this weekend and blogged about it here. I spent $1 on my headpiece. I was determined not to spend much on my outfit. I kept searching second-hand stores for the right thing. I almost bought an 'okay' dress a couple of times. Then I finally found the perfect dress at 8:02pm when Goodwill was closing. I bought it without looking at the size or trying it on. It was $7.99. I got home to realize it was size 16W. It was too perfect, though, so I was going to make it work. I'm so sorry. My mirror has paint remnants on it from our paint sprayer. I should have covered it better when we were renovating. As you can see the dress is very big. It came with a shawl. I'm not sure I'm going to use it though. The length isn't too bad. It touches the floor in the back so I will have to cut some off. The biggest problem is how low it hangs. I knew it would be difficult to take it up at the shoulders because of the two layers and all the bead work. I decided to temporarily pin tuck at the shoulders. This would solve the problem and the dress can be put back after the party. I also took the seam in by the bust just a little. It is still big, but looks better. I made a belt out of black lining fabric. In a lot of the 1920s pictures I looked at, the dresses had a dropped waist. So the belt helps it to look not so big and more appropriate for the era. I also found the perfect shoes. They look a little dowdy but exactly what I need to look more authentic. Now I have to figure out how to do my hair and makeup! I'll post a picture of Scott and I all glammed up next week some time!